On every long distance trek a day off is welcome. For some it’s a chance to rest sore feet, catch up on your journal entries or check in with the folks back home. 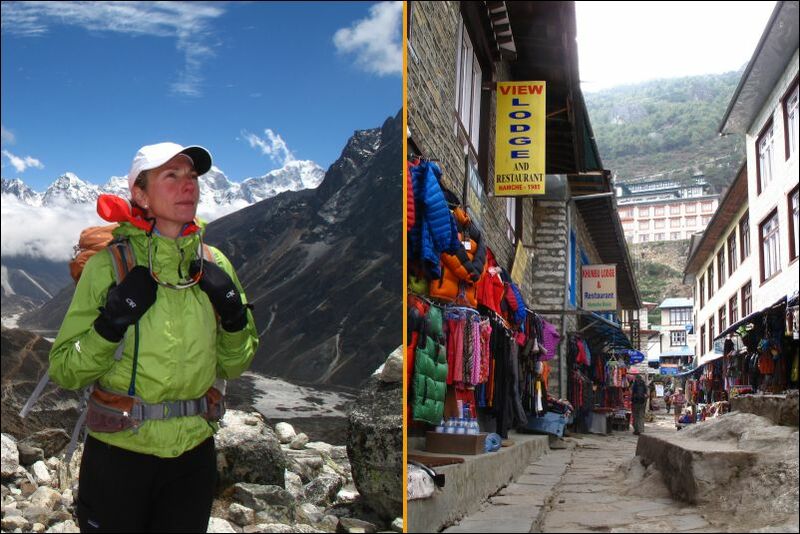 On Tusker’s Everest Base Camp trek a day off can be as active and as interesting as you want it to be. You can veg out in the lodge or venture out taking photos of the multicultural characters who ply the unpaved alleys in a global crossroads village. Or you can continue hiking on half day acclimatizing routes that offer superlative views of the Khumbu Valley and four of the world’s six highest peaks. You can also immerse yourself in Sherpa, Buddhist and Himalayan culture that is about as different as you will find on any Tusker adventure. Naamche Bazaar and Pheriche are very different villages and this is where you will spend your off days. Each offers a deep dive into Himalayan mountaineering culture as well as amazing acclimatization hikes. Trekking to Everest Base Camp at 17,598 is the trip goal, but you would be remiss not to take full advantage of your time spent in these hanging mountain villages below the Everest massive. Namche Bazaar is the largest village in the Khumbu Valley with a population of around 1,800 and is practically a Sherpa “metropolis” with its stores, market, museums, hotels and restaurants. Some trekkers hike to Naamche (11,290 feet) and never go higher spending a few days here to become part of the scene and see the Saturday market or various festivals. This is the crossroads of the Everest region trail network and in a smaller sense – the world. You could meet Tibetans on a religious pilgrimage or a group of Parisian stock brokers in the streets and bars of Naamche. Take advantage of this cultural cavalcade and always have your camera with you. Find the Yak parking lot off a side street; it may be the only one in the world. Wander into the bazaar and haggle with vendors for the medications you might have forgotten or the piece of art work you can’t live without. Never settle on the original price and don’t expect the wily vendor to accept your bottom fishing first offer. The true price is somewhere in between, so negotiate in a respectful manner. If you need a piece of hiking equipment Naamche has two excellent outdoor stores where you can pick up North Face and Sherpa branded, and knockoff merchandise. And you should because this will be the last stop where you can find trekking gear. You didn’t come to the Himalayas to go to museums but there are a few small ones here worth your time and could add to your understanding of the trail ahead. Mt. Everest is part of Sagarmatha National Park and at its visitor’s center in Naamche there is info on wildlife as well as good photos of Sir Edmund Hillary, Tenzing Norgay as well as other famous mountaineers. Nearby is the Sherwi Khangba Center that presents Sherpa culture in an authentic Sherpa home. Part of the house contains the Mt. Everest documentation center where records of all the Sherpas who climbed Mt. Everest are kept. There is also an excellent international library where photos, books and videos of Sherpa culture and mountaineering are on display. It’s a large collection so if you want to spend your off day off your feet then take a seat and explore a different culture. You could spend your two days just wandering around Naamche eating in the bakeries and trading travel stories with the eclectic crowds in the bars, but you should do some of the acclimatization hikes. This will help your lungs and blood flow but also stimulate your intellect by opening a Himalayan history book. There are many acclimatization hikes above Namche but among the best is the half day loop up to Kunde and Khumjung (where you will stay the following day.) In 1966 Hillary opened the Kunde Hospital and it has been serving both locals and visitors since. The 15 bed hospital provides a full range of health care so if you have a stomach bug that won’t go away or need your appendix taken out this might the place. If nothing else, stop by and make a contribution. Hillary’s hand is evident throughout the Khumbu Valley through water, school and bridge projects, but the hospital is perhaps his lasting legacy. From Kunde continue upward to Khumjung you get views of several of the Himalaya’s iconic peaks, Lhotse, Ama Dablam and partial views of Everest. In Khumjung, the monastery houses the scalp of a Yeti. Sitting at 14,200 feet Pheriche is where you need to linger and take a deep breath. It is best known for its hospital run by the volunteers of the Himalayan Rescue Association and since its inception in the 1970’s has done cutting edge altitude sickness research. Its herculean effort in the 2015 earthquake treating 73 patients gained it global kudos and you may want to drop in and add yours. There isn’t much else to do here and perhaps that’s a good thing because you need to acclimatize. Pheriche sits in a valley above the Tsalo River and below the larger village of Dingboche an hour’s hike away. Still higher is the Nangkartshang Hermitage and beyond is a trail lifting you higher to the Nangkartshang summit at 16,700 feet. This is a spectacular acclimatization hike that arguably offers the best views of the Everest range above the Khumbu Valley. The whole package is revealed– the snow laden peaks all well above 20,000 feet, the glaciers and rivers flowing out of them as well as a large blue lake in a distant cirque. To retreat and sleep back at Pheriche over 2,000 feet lower will do wonders for your blood oxygen levels helping you prepare for the days ahead and the trek up to Everest Base Camp. Trekking through the Khumbu Valley up to Everest Base Camp is a long trek through the Himalaya that covers 14 days and around 75 miles. There are two-night acclimatization rest stops in historic mountain villages and for some the chance to explore them is among the trip’s highlights. Technically the reason Tusker spends two nights in both Naamche Bazaar and Pheriche is to allow their trekkers to adjust to altitude, and that’s reason enough. But acclimatizing can be more than letting your lungs and blood breathe. It’s a chance to meet the locals and gain some insight into how they have adapted to one of the harshest most beautiful places on the planet. They have adapted over 6,000 years evolving the lungs and blood cells to deal with thin air. They have also developed a unique mountain culture blending religion, farming and trading to survive. It’s a special place with special people so don’t waste a second – breathe it all in.